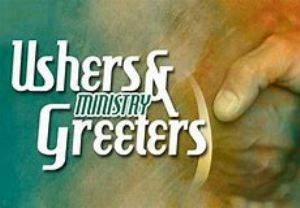 The liturgical ministry of greeters and ushers is more than just an important hospitality job, it is a gift of service that is extended to all entering the church. The Greeter is often the first person one meets, or point of contact, someone who welcomes those entering the church to celebrate and pray with us at Mass. 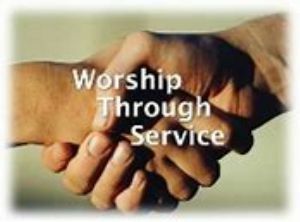 They create that important first introduction and impression of friendliness and a comforting welcome, extending the hand of hospitality of our Christian community. 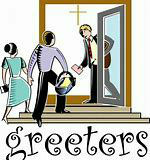 On Sundays, our Greeters help to guide and welcome both new and existing parishioners before Mass. Aside from handing out the hymn books, mass cards and newsletters, they are often among first to arrive and help prepare to welcome those joining us in prayer and Mass. And often they are the last to leave, after Mass and can be seen quietly and politely collecting hymnals and mass cards and returning these to the bookshelves to help keep the foyer and church tidy and presentable ready for the next Mass. 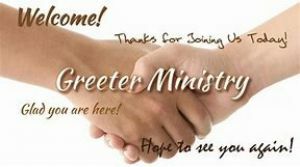 The ministry of Greeter and usher continues the essence of Jesus’ own ministry and mission. He welcomed everyone extending love, patience, tolerance and acceptance to all. We are grateful and thankful to all our volunteer Greeters and Ushers.